The book "In the Name of the Azerbaijani Woman" is a new publication of Heydar Aliyev's Heritage Research Center. The book which is dedicated to the 10th anniversary of the decree "Woman policy in Azerbaijan Republic" signed on the 6th of March in 2000 by nationwide leader Heydar Aliyev interprets the female policy of our government by important documents. The consultant of the book is academician Asaf Nadirov, academic consultant and the author of the preface is the chairperson of State Committee of the Republic of Azerbaijan on the problems of Family, Women and Children Hijran Husseynova, editor responsible is Vurghun Suleymanov, and the chief of working group is Fuad Babayev. Annotation for book: "In the Name of the Azerbaijani Woman" is a new publication of Heydar Aliyev Heritage Research Center. The book is dedicated to the 10th anniversary of the decree "Woman policy in Azerbaijan Republic" signed on the 6th of March in 2000 by nationwide leader Heydar Aliyev. The nationwide leader of the Azerbaijani people Heydar Aliyev and President of the Republic of Azerbaijan Ilham Aliyev have numerous speeches and addresses elucidating the woman policy from different points. Great quantities of these documents are in this book. 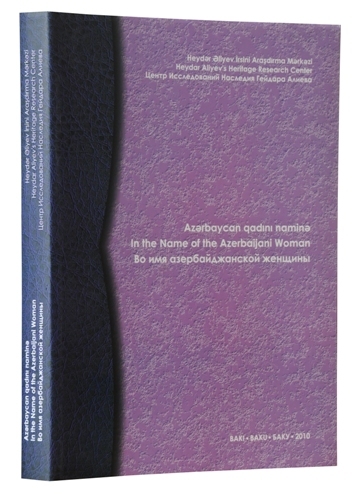 The book includes the speeches made by great son of the Azerbaijani people Heydar Aliyev in the Women's Congresses and his congratulations on the occasion of the holidays and the congratulatory letters of President of the Republic of Azerbaijan Ilham Aliyev to the women on the occasion of the International Women's Day and other events. The book also includes the speeches made by President of Heydar Aliyev Foundation Organization, UNESCO and ISESCO Goodwill Ambassador Mehriban Aliyeva and her interview to "Baku"magazine. The decree "Woman policy in Azerbaijan Republic" and the Act "About Gender Equality" are also among the documents included in the book. The text of the Act is in the book too.